My almost 8 month old is really getting into books these days. I mean, apart from wanting to eat them, he'll sit to listen to them and look at pictures. As most people know, the most attractive type of book to a baby is a book with a picture of a baby inside of it! He smiles, laughs and smacks the book whenever he sees a baby. I'm hoping that the smacking part won't transfer over for when we're around other babies in person. At any rate, we're big on babies around here. And books! We are particular fans of Roger Priddy books which contain real pictures. I love watching how my boy recognizes various things in the Priddy books. A favorite series is the Happy Baby series which includes ABC's, Colors, and Word (among others). The pictures and colors are so welcoming and engaging that my 7 mo. old will sit through the entire alphabet! Hence, I like these books. 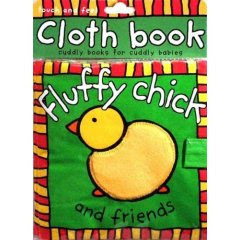 My mom just purchased the Fluffy Chick and friends cloth book, also by Priddy, for him to enjoy - and enjoy it he does! Each page has an animal and rhyme on it. Each animal has a different cloth texture on his body. The pig even has a little curly tail for you to pull on (or chew on, if you prefer). It's an extremely cute book. I'm not much one to follow trends, specifically that of The Purpose Driven Life. However, the baby book by Warren's daughter, Ann Warren Hilliker, is pretty good. It holds my baby's attention at any rate. 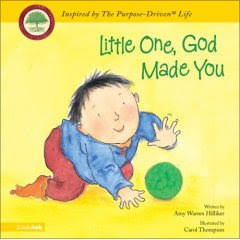 The message of the book is simple and clear: God made You to Love You. (I'm not ready to get into a theological debate over predestination here. Let's just keep this simple!) The drawings are simple enough that my son seems to register that he's looking at babies in action. It's not likely that he'll lose interest whenever we're reading this book. It's been fun to read with my little guy. It becomes more enjoyable with each passing day as he becomes more and more aware of the world around him. A friend of ours was sorting through her picture books and let us peruse the books in her discard pile. I selected a stack and brought them home and have, literally, had to fight the boy back from them. (Of course, he currently thinks they are for eating and sliding about the room.) He'll learn. hi i was just browsing the net to see if i could find any books that i could read out for my lil 5 month old baby girl....and i was wondering if its too early to start her on reading....just saw ur blog so i guess its a good idea for me to get her books.any suggestions?